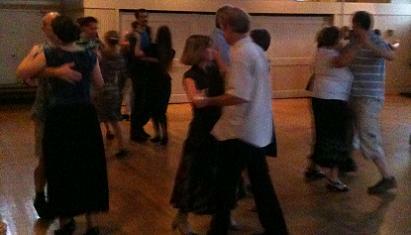 Advance registration for most vintage dance classes is NOT required; register and pay fee at first lesson. Although you can register without a partner, we recommend signing up as couples to promote gender balance. In most vintage dance classes, the instructor will ask you frequently to change partners. There are several reasons for this. People learn dance more quickly when they dance with different partners, because each partner will have different strengths and weaknesses. Changing partners allows those who come without a partner to dance wtih someone. Also, vintage dance manners encourage dancing with different partners to be sociable and assure that everyone has a good time. If you come with a special partner and you really only want to dance with that partner, please notify the instructor. If you would like us to teach a particular type of vintage dance in the future, please e-mail your request to lexingtonvintagedance@gmail.com Questions about our classes may be sent to this address also.